Chromium is an essential mineral that supports blood sugar levels by enhancing the action of insulin. It is directly involved in carbohydrate, fat, and protein metabolism. Diets high in sugar can decrease chromium in the body as well as infection, exercise, pregnancy, and stress. 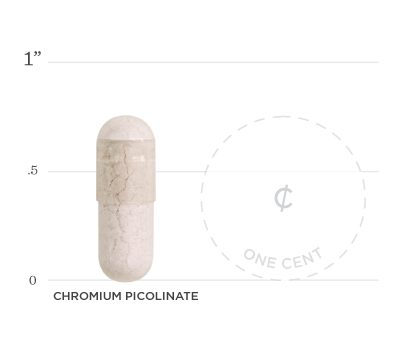 Chromium picolinate plays an important role in the metabolism of macronutrients, especially carbohydrate metabolism, through its impact on the hormone insulin. 2. Press RI, Geller J, Evans GW. The effect of chromium picolinate on serum cholesterol and apolipoprotein fractions in human subjects. West J Med. 1990;152(1):41-5. 3. Anton SD, Morrison CD, Cefalu WT, et al. Effects of chromium picolinate on food intake and satiety. Diabetes Technol Ther. 2008;10(5):405-12. 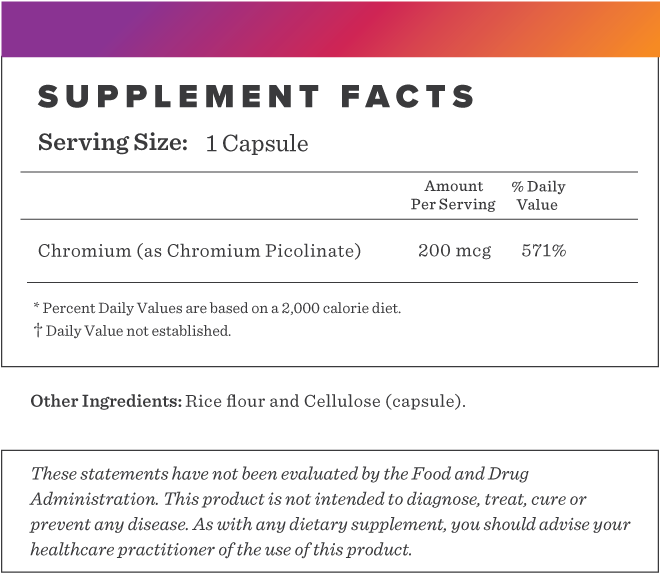 Below we've broken down the main functions of our Chromium Picolinate and the benefits it can provide. Chromium is involved in glucose metabolism. Research shows it can improve glycemic control in those who are deficient by enhancing insulin sensitivity (1). Studies show it can improve cholesterol and fat levels in the blood (2). A double-blind placebo-controlled 8-week study concluded chromium supplementation reduced food intake, hunger, and fat cravings in healthy overweight women, and even tended to decrease body weight (3).